The agreement between Darren Oliver and the Rangers is now official. He will receive $3 million in base salary this season with a vesting option worth $3.25 million. 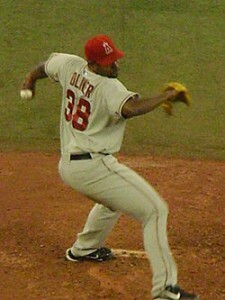 The option would vest if Oliver appears in 59 games in 2010. He has averaged 58 games a season over the last three years. If the option is not picked up, Oliver would receive a $500,000 buyout, guaranteeing him at least $3.5 million. Oliver is a good acquisition in my opinion. Originally a starting pitcher, he has been a reliever of late. And not a left handed specialist, Oliver has been tough on right handed hitters during his career. The last two years of which was spent with the Los Angeles Angels where he went 12-2 with an ERA under 2.85. A little known fact about Oliver is that he swings a pretty good bat. He has a .221 lifetime batting average. Of course in the Designated Hitter ruled American League Oliver is unlikely to be called upon to hit. Note- I’ve always liked Oliver. Partly due to the fact he was a pitcher on my first ever Star Tournament Championship team back in October 2000. Philadelphia Phillies left-hander Jamie Moyer was hospitalized this week with a blood infection, general manager Ruben Amaro Jr. said Friday. Moyer, who underwent surgery Oct. 2 to repair three torn muscles in his groin and lower abdomen and was to miss the rest of the season and postseason, was “doing fine” and has been in Thomas Jefferson University hospital in Philadelphia since Wednesday, Amaro said. Moyer’s wife, Karen, confirmed in an e-mail to The Associated Press on Saturday that her 46-year-old husband was doing OK.
That’s good news and I wish Moyer a speedy recovery. I myself just spent four days last September in the hospital due to an infection. It wouldn’t surprise me if Moyer gets antibiotics at home. For 10 days I had a portable I.V. machine attached to me. Today’s Philadelphia Phillie-Colorado Rockie game has been postponed. 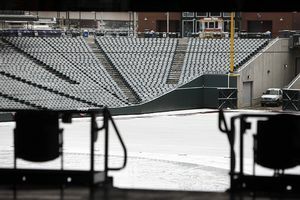 Game 3 of the Phillies-Rockies playoff on Saturday night has been postponed because of cold, snowy weather. Major League Baseball rescheduled the game for Sunday night at 10:07 p.m. ET, and Game 4 was pushed back to Monday, at a time to be determined. Game 5, if necessary, will be played as scheduled on Tuesday in Philadelphia, without a day off for travel. Has a MLB postseason game ever postponed before due to snow? Will the extra day in Denver disrupt cause problems with Philadelphia’s hotel accommodations? The Tampa Bay Rays had to find a new hotel during when last year’s World Series was extended due to weather. Greeley police arrested former major league pitcher Shawn Chacon on Monday night on a felony warrant for suspected unpaid gambling debt in Las Vegas. Police received an anonymous tip at 7:57 p.m. Monday that Chacon was at Highland Park Lanes, 1900 59th Ave. in Greeley, and that tip led to his arrest soon after, according to police reports. Chacon was taken to the Weld County Jail, and bail was set at $165,125. The arrest comes after Chacon was wanted in connection with three bad checks written to Caesars Palace in March, each for $50,000, according to the Las Vegas Sun. Chacon was a standout athlete at Greeley Central High School before being drafted by the Colorado Rockies in the third round of the 1996 draft. He made the Major League All-Star team in 2003 before being traded to the New York Yankees in 2005. After his stint with the Yankees, Chacon went on to pitch for the Pittsburgh Pirates and Houston Astros. The story of Shawn Chacon is a sad one. He was once a promising pitcher, now his career and personal life appear to be in ruins. The Milwaukee Brewers made big changes to their thin bullpen on Tuesday. One day after reliever Jorge Julio allowed five runs while facing six batters in the sixth inning of Milwaukee’s 7-4 loss to the Florida Marlins, the Brewers released the right-hander. Julio entered Monday night’s game in Miami with Milwaukee leading 4-2. He gave up two hits, hit two batters, walked one and another reached on an error. Signed to a one-year, $950,000 deal in the offseason, Julio was let go Tuesday after going 1-1 with a 7.79 ERA in 15 appearances. The Brewers called up right-hander Mike Burns from Triple-A Nashville. Burns was 6-2 with a 2.98 ERA for the Sounds. Milwaukee’s manager says the bullpen is thin. Which it is, particularly after David Riske was lost for the season after elbow surgery. Julio, who has played for eight ML teams since 2001, throws very hard. Something baseball managers like. I expect a ninth team to take a chance on him before the 2009 season is over. Perhaps even by the 4th of July. The Colorado Rockies fired manager Clint Hurdle on Friday, less than two years after their incredible “Roctober” run to the World Series, and replaced him with bench coach Jim Tracy for the rest of the season. Without reliable hitting, pitching or defense, the Rockies stumbled to an 18-28 start and were 14Â½ games behind Los Angeles in the NL West heading into Friday night’s action. Hurdle, who had been Colorado’s manager since replacing Buddy Bell three weeks into the 2002 season, was 534-625 for a .460 winning percentage in his seven-plus seasons. I agree Hurdle did nothing wrong. The Rockies just haven’t performed and the manager as always makes a convenient scapegoat. Tracy has managed both the LA Dodgers and Pittsburgh Pirates. While the Pirates stunk during Tracy’s term with the team and would have done so with anyone in the job, the Dodgers arguably were one of baseball’s biggest MLB underacheivers from 2001-2005. Tracy is unlikely to alter Colorado’s fortunes this year. The Colorado Rockies and reliever Alan Embree agreed to a one-year contract with a mutual option for 2010. Embree went 2-5 with a 4.96 ERA in 70 games for the Oakland Athletics last season. Oakland had declined its $3 million option on him. The 38-year-old played on nine major league teams including Oakland. He pitched in two World Series, with Cleveland in 1995 and Boston in 2004. This is a risky signing for the following reasons. 3 Embree is 38 years of age. A one out left handed specialist can’t do a ton of harm. Except if the one or two games that are blown by the pitcher come back to haunt a team in a tight pennant race. Note- I like Embree. He was a reliever on one of my two winning Star Tournament championship teams. Former manager Don Baylor returned to the Colorado Rockies as hitting coach Monday. Baylor was one of five coaches added to manager Clint Hurdle’s staff. The team also hired former major league manager Jim Tracy as bench coach and Rich Dauer as third base coach. Jim Wright becomes the bullpen coach and Brian Jordan will be strength and conditioning coach. Baylor was the first manager in Rockies history, leading the team from 1993-98 — including a playoff berth in 1995. Pitching coach Bob Apodaca and first base coach Glenallen Hill are the only coaches to return to Hurdle’s staff following last year’s disappointing 74-88 season. Colorado let go of hitting coach Alan Cockrell, third base coach Mike Gallego and bench coach Jamie Quirk in early October, a year after the Rockies won their first NL pennant. The Rockies’ coaching staff now has 16 years of big league managerial experience, in addition to Hurdle’s seven years on the job. Baylor also managed the Chicago Cubs from 2000-02. Tracy was in charge of the Pittsburgh Pirates (2006-07) and Los Angeles Dodgers (2001-05). If Hurdle falls out of favor with team management, there are plenty of experience around when it comes to who would be the interim manager. On a serious note, wikipedia says Baylor has been diagnosed with multiple myeloma. It is good to hear he can coach in the major leagues again.